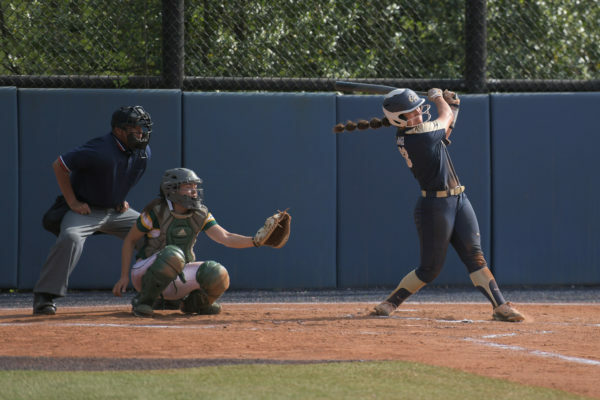 After a plethora of cancellations, the GW softball team was finally able to hit the field Saturday, splitting a home doubleheader against Rhode Island. GW was able to squeak one out against the Rams 4-3 in the first game but lost 13-12 in extra innings in the nightcap. The Colonials (6-16, 1-1 A-10) had four hits along with four runs in the first inning of the second game, which included a three-run homer by freshman Jackie Yaniga. The offensive production was quickly matched by a five-run second inning by the Rams (2-16, 1-1 A-10), which led to sophomore pitcher Gabby Culp’s exit. Rhode Island led 7-4 in the third inning, but GW would not let the lead get them down. In the bottom of the third, the Colonials racked up five runs on RBI singles by freshmen Lisa Cohen, Colleen Kegler and Chrysanthi Halkiotis, which gave GW a 9-7 lead. When the Rams regained the lead 12-10, the Colonials were able to tie things up with a pair of runs in the seventh inning on RBI singles from Cohen and freshman first baseman Caroline Howe. With the game tied at 12 in extra innings, the small group of fans at Mount Vernon got animated. However, the cheers were not enough to help Culp hit her spots, as a URI single knocked in Shelly Peterson, the eventual winning run. “I encourage my great group of girls to compete very hard – play in every inning and battle to the bitter end,” first-year GW coach JoAnne Ferguson said. Despite the split, GW players said they were happy to be back in the swing of things. “So many of our games have been decided by one run, which sometimes makes all our efforts seem fruitless, but it’s all a matter of timing and growing as a team until our full potential is evidenced,” Ferguson sad. The Colonials were able to pull out a 4-3 victory during the first game of this doubleheader. Meyers scored from third in the seventh inning on a wild pitch after the Rams had tied it at three in the sixth. “We are having a fun, good year concentrating on offense and defense, and it is great because our team chemistry is completely bonded,” freshman Cat Belanger said. On Thursday, the Colonials faced off in a double-header against non-conference challenger Marist College, dropping both games 12-2 and 5-4. However, Yaniga, recently named the A-10 Softball Rookie of the Week, finished with two hits, two RBI and a run scored. Freshman Jen Hrycyna also pitched a complete game. The Colonials hit the field on Tuesday to face La Salle at 2 p.m. at Mount Vernon.